Benevolent27 added a comment to T1983: Turret aim problem. I've been having this issue on our multiplayer server, LvD. When using a power 1.0 ship with several turrets on it, attacking pirate stations and pirate ships, the select-fire mode is shooting at empty space rather than the intended target. The shots are coming out of the turret at 90 degree angles rather than shooting straight. I have 2 stop turrets on the left and right side of my ship. When attempting to hit a target directly in front of me, the stop turrets point straight at the target, then their 90 degree angle shots hit my own ship and stop me from moving! And all damage turrets miss. So I am unable to do any damage to the target in front of me. Benevolent27 added a comment to T2392: lock missiles target incorrectly when fired at a non system target. Benevolent27 added a comment to T2350: Exiting (normal) because of exception java.lang.RuntimeException: SegmentData should already be normal version. And the crash is back. We have had 7 crashes tonight now. Benevolent27 added a comment to T2415: Crash upon opening Galaxy map in faction claimed territory. This may have been related to an issue where players in a "build" sector would create a shop and try to sell items to NPC's. These build sectors are about 19 years worth of distance away from the main galaxy. Players in these build sectors have creative mode on. As the trade ships were traveling to the main galaxy, it would crash people's client's when it attempted to draw the trade line across the massive distance. Benevolent27 renamed T2840: Systems 2.0 - Sector Imports are failing with ClassCastException - Exports seem corrupted when including docked entities from "Systems 2.0 - Sector Exports are failing with ClassCastException" to "Systems 2.0 - Sector Imports are failing with ClassCastException - Exports seem corrupted when including docked entities". Benevolent27 edited Steps to reproduce on T2840: Systems 2.0 - Sector Imports are failing with ClassCastException - Exports seem corrupted when including docked entities. Benevolent27 edited the description of T2840: Systems 2.0 - Sector Imports are failing with ClassCastException - Exports seem corrupted when including docked entities. Benevolent27 created T2840: Systems 2.0 - Sector Imports are failing with ClassCastException - Exports seem corrupted when including docked entities. Benevolent27 renamed T2810: some /entity and /shield admin commands do not work in power 2.0 from "/entity_reboot admin command does not work - Puts it back into overheating mode" to "/entity_reboot admin command does not work - Instead of rebooting, it resets back to max overheating time". Restricted Application added a project to T2810: some /entity and /shield admin commands do not work in power 2.0: Issue Navigation. Benevolent27 created T2450: "$sit" showing in keyboard shortcut help upon startup - Dev version - Linux. Benevolent27 edited the description of T2419: Ethereal Entity / Ghost Ship. Benevolent27 added a comment to T2419: Ethereal Entity / Ghost Ship. Also to add to this, when I used the "/save BuggedBlackRose" command to create a blueprint, it creates a blueprint that has 0 points in everything, but then has 60,496 points in defense. 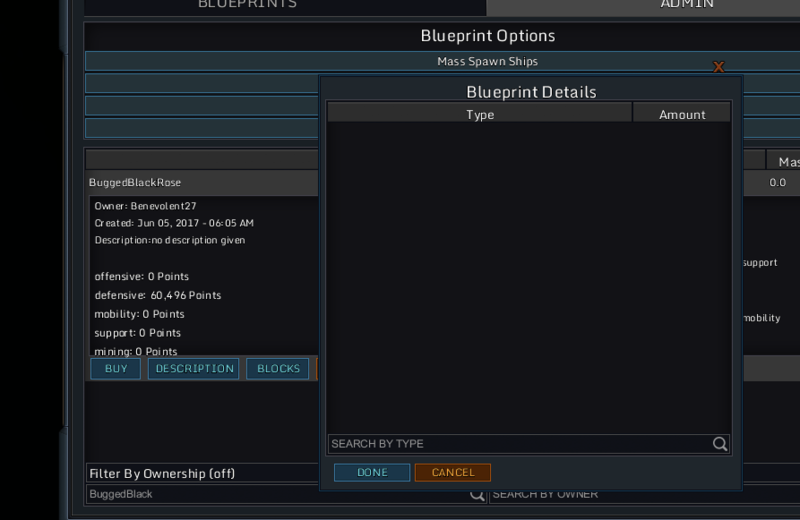 When clicking the "blocks" button to see what blocks are in the blueprint, it is blank. Benevolent27 created T2419: Ethereal Entity / Ghost Ship. Benevolent27 added a comment to T1249: Big enough mining drones don't salvage. We've been having problems with fleets refusing to mine on LvD as well. I tested with some 3k miners. The salvage computers had salvage beams and a storage attached. Plenty of power and thrust. When issuing the command, nothing happens. Benevolent27 added a comment to T1187: AI/fleet ships can move when they sometimes shouldn't. The first issue has since been fixed, but the second issue of fleet ships being able to move into and out of noexit/noenter sectors still exists and is a problem. We use these flags for our quests and build accounts (players are locked into a sector with creative mode), so this is a bit of a problem for us as we've been having users using fleets to get out of these sectors. Benevolent27 added a comment to T2353: Sector Import fails to load ships docked to planet plates or asteroids. Just thought I'd update this. Entities are now spawning in when the sector import is completed. I did not check if there are still errors in the logs though. Restricted Application added a project to T2353: Sector Import fails to load ships docked to planet plates or asteroids: Issue Navigation. Benevolent27 added a comment to T2352: Shipyards causing disconnect and class cast exceptions. I decided to also test on our server, since I have full access to the logs and could submit them here. I thought it might also be useful to have a snapshot from whatever the issue may have been on the version we are currently running. And furthermore, when docking a ship to the shipyard and manually undocking, also causes a crash to main menu. When rejoining the server, the ship was also gone. Also possibly related. If you enter the design ship (not physical), then bring up the DEL menu and click the "Undock all" button, it will crash you. Upon rejoining, all the docked entities on the design are gone. Unloading the design and reloading it works, but the entities are still undocked. Restricted Application added a project to T2352: Shipyards causing disconnect and class cast exceptions: Issue Navigation. Benevolent27 updated subscribers of T2350: Exiting (normal) because of exception java.lang.RuntimeException: SegmentData should already be normal version. Benevolent27 edited the description of T2350: Exiting (normal) because of exception java.lang.RuntimeException: SegmentData should already be normal version. Restricted Application added a project to T2350: Exiting (normal) because of exception java.lang.RuntimeException: SegmentData should already be normal version: Issue Navigation. Benevolent27 added a comment to T1806: Player shops that are filled by admin command sell all types of blocks on trade network, including disabled blocks. Just a quick update on this. Since custom shops were problematic and we couldn't refill them without also filling them with a bunch of disabled blocks, we now just use stick shops. Though it would be nice to reimplement the custom shops. Restricted Application changed the status of T2019: ZipException preventing logging into a public server and then random RunTime exceptions after fix about textures not being loaded. from "Feedback" to "Open". @AndyP Oh, this is old. It hasn't happened since then. The "textures not loaded" bug has also since been fixed (Though it still seems to happen sometimes when quick switching between servers, without fully closing the client and re-opening it). Benevolent27 added a comment to T2339: /load_as_faction crashes server. Edit: Since I cannot edit the main thread here any longer, I'm going to track my tests here. If a command results in an error, crash, or other noticeable bug, I'll put it under an "error" section. All of these tests were done spawning in or modifying an entity that had no faction block on it. Benevolent27 added a comment to T1821: Placing Blueprints onto docks through Build Mode . Benevolent27 edited the description of T2339: /load_as_faction crashes server. Restricted Application added a project to T2339: /load_as_faction crashes server: Issue Navigation. Benevolent27 added a comment to T2267: Server Shut Down for no apparent reason. Benevolent27 created T2286: Thread Dumps not created on linux. Sorry about the wait. I've been a bit overloaded at home. Benevolent27 created T2276: Sector Import does not load rail connections. Benevolent27 edited the description of T2269: Chunks disappearing - Bases and Planets getting swiss cheesed. Benevolent27 created T2269: Chunks disappearing - Bases and Planets getting swiss cheesed. Restricted Application changed the status of T2267: Server Shut Down for no apparent reason from "Feedback" to "Open". Sector export uploaded. I went to the sector to investigate. The ship in question was in the sector, but not at the sector coordinates indicated in the log file. Benevolent27 created T2267: Server Shut Down for no apparent reason. Benevolent27 added a comment to T2222: "/territory_make_unclaimable" command not working. Still having the issue. This is problematic since the quests on our server require a player to NOT be able to claim the system that their quest instance is created in. Benevolent27 created T2222: "/territory_make_unclaimable" command not working. Benevolent27 created T2218: /SQL_Query command cannot be used with starnet.jar. Benevolent27 added a comment to T2212: Steam forces starmade to update. I have this issue too. When we decide to hold off on an update for our server, my steam client forces me to update.. which makes me have to downgrade.. and then when we move forward with the update, I have to then re-update. So, it takes 3 installs. Benevolent27 added a comment to T2135: BlockConfigImport.xml not importing new Recipes. This is currently a not supported. But will most likely be added. Benevolent27 added a comment to T591: BlockConfigImport.xml not import recipes.. If the server lives on Linux, you can use this bash script. The script is not mine, found on the Internet. beginBlock='<Recipes>'                # start string of text block that would be replaced. Should be the Regular expression. endBlock='</Config>'  # end string of text block that would be replaced. Should be the Regular expression. # No user intervention beyond this point !!!!!!!!! Of course you need to fix the file paths. Carefully, the script completely replaces the list of recipes. zamena - file with permissions r-v, you need to create an empty file manually. This would be nice to be able to do. We use custom blocks on our server, and not being able to transfer the recipes upon version update, requiring manual updates to the /data/config/BlockConfig.xml file, is definitely not good. Benevolent27 edited Steps to reproduce on T2135: BlockConfigImport.xml not importing new Recipes. Benevolent27 created T2135: BlockConfigImport.xml not importing new Recipes. Benevolent27 created T2042: "Send Report and Logs" button doesn't work in the "Report Bug or Crash" window. Benevolent27 renamed T2019: ZipException preventing logging into a public server and then random RunTime exceptions after fix about textures not being loaded. from "ZipException and then " to "ZipException preventing logging into a public server and then random RunTime exceptions after fix about textures not being loaded.". Benevolent27 edited the description of T2019: ZipException preventing logging into a public server and then random RunTime exceptions after fix about textures not being loaded..
Benevolent27 created T2019: ZipException preventing logging into a public server and then random RunTime exceptions after fix about textures not being loaded..
Benevolent27 added a comment to T1954: Steam Update Downgraded me instead up upgrading. As a side note, when you updated from 214 to 234 with the new launcher, did it download a decent amount of files? It could have been that it was correctly updated but the launcher still thought it was your downgraded version. If that was the case, it should barely have downloaded a file, maybe 1, when you upgraded to 234. Benevolent27 edited Steps to reproduce on T1954: Steam Update Downgraded me instead up upgrading. Benevolent27 created T1954: Steam Update Downgraded me instead up upgrading. Benevolent27 added a comment to T1143: overheating fleet ships can't be salvaged. I'm still having this issue. I destroy my enemies and cannot salvage the corpses of their ships. They deserve to be mined. Benevolent27 edited Steps to reproduce on T1911: Power Auxiliary Block Causing Server Crash. Benevolent27 edited the description of T1911: Power Auxiliary Block Causing Server Crash. Benevolent27 created T1911: Power Auxiliary Block Causing Server Crash. Benevolent27 edited the description of T1829: Server Trouble While Upgrading - customBlockBehaviorConfig.xml is causing infinite loop. Benevolent27 renamed T1829: Server Trouble While Upgrading - customBlockBehaviorConfig.xml is causing infinite loop from "Server Cannot Be Upgraded - customBlockBehaviorConfig.xml is causing infinite loop" to "Server Trouble While Upgrading - customBlockBehaviorConfig.xml is causing infinite loop". Benevolent27 created T1829: Server Trouble While Upgrading - customBlockBehaviorConfig.xml is causing infinite loop. Benevolent27 added a comment to T74: creating a new universe sets all blueprints to enemyusable/others and owner to none. The game doesn't know who owns a blueprint. It would make no sense to put it into the blueprint itself, as then i couldnt be spawned when downloaded and would be easily changable anyway. To use the same catalog in another world, copy over the catalog.cat file. Setting them to enemy usable might be a bug though. What is the server setting for that? Benevolent27 edited the description of T1806: Player shops that are filled by admin command sell all types of blocks on trade network, including disabled blocks. Benevolent27 created T1806: Player shops that are filled by admin command sell all types of blocks on trade network, including disabled blocks. Benevolent27 added a comment to T1473: AI Error occured on Server, class cast exception. We seemed to have a similar bug here on LvD. Here's a brief excerpt of the different errors displaying at this time. There were hundreds of each, but the first bug had repeated for a long time before the [FATAL] errors started. Benevolent27 added a comment to T1698: Log files have an unexpected file extension. This does make sense, however if this could be an option in the server.cfg file, that would be ideal. I recommend this because the change would break wrappers and other scripts that utilize the log files. (Including scripts I have created) Though I don't mind updating my scripts, there are people that rely on scripts that they have not created and this would create problems for them. Benevolent27 created T1761: Shops on the Trade Network will buy any item. Benevolent27 added a comment to T1658: shop price not set allows you to take and store for free. Benevolent27 added a comment to T1659: shop permissions lock out everyone. Confirmed for "no enemies" permission. Benevolent27 added a comment to T1455: Database error PUBLIC.ENTITIES. Update: I went ahead and deleted line 93 from the ".script" file in the index folder and now the world loads successfully. Though I won't be using this world file for the server, at least now it appears I can run a copy of the server to help people get back some of their ships. Benevolent27 added a comment to T752: Shipyard loading issue and greyed out buttons. I get this issue as well (on multiplayer), where the shipyard gets stuck loading a design. Sometimes restarting the game fixes the issue. Other times it does not, so my shipyard is useless. I have tried removing the shipyard computer, anchor, and shipyard modules to sort of "reset" the system, but it doesn't work. I wish I could say what events lead up to this, but I cannot. I can say though that I don't do a lot of converting blueprints to shipyard designs. It seems completely random to me. Sometimes the shipyard works, sometimes it does not, and it doesn't seem to matter what I was doing with it beforehand. It's very frustrating though, so I just don't use the shipyard at all anymore except to break down ships. Benevolent27 added a comment to T1401: Editing blueprint catalog causes whole-server lag. Another server I tried, StarBits, was having this same issue, and they also deleted all their blueprints. To reiterate: upon a reset of our blueprint database, the blueprint related lag went away. Benevolent27 added a comment to T1387: Build Helper Lock. Basically "copy" the ship core (or any other block) with an active build helper and then paste it where you want the build helper to move. We had this problem on my server as well, StarSide. They even deleted all the blueprints and the problem is still happening. Benevolent27 added a comment to T1230: Cannons and Other Weapons Stop Doing Damage to Detached Entities. Benevolent27 created T1417: Cannot Mine Overheating Fleet Ships. Benevolent27 added a comment to T652: docked entries undock and spawns nearbly the ship sometimes when logged out. I have this problem all of the time. It is SO frustrating. I have lost many hours of gameplay fixing problems as a result of it. I have two login names for the server I play on and it has happened to both logins, though it is more common for one of my logins than the other. Benevolent27 created T1230: Cannons and Other Weapons Stop Doing Damage to Detached Entities. Benevolent27 added a comment to T1154: Game will only calculate damage for the first few missiles rendered. I don't know if this is the same issue you are referring to or not, but we have been having a lot of trouble with missiles recently on our server. After a reboot, it seems like missiles will do some damage for a while, and then they stop. This is a server-wide issue. All players on the server can no longer damage anything with missiles. Benevolent27 added a comment to T958: Locking missiles do no damage to pirates that cross sector boundaries.. I'm having the issue where my turrets do 0 damage to pirates on my titan ship. The missiles also do not damage asteroids that are a sector away. On the server I am playing on, sectors are I think 13k large. The pirates I was attempting to hit were between 10 and 26k away. All missile have a range of between about 36 and 46k. There are close to 500 missile computers spread to 8 different turrets. Even when I turn off half of the turrets, 0 damage is done. I just finished this thing in single player and spawned it into the server to find out it isn't working. Quite disappointed. Benevolent27 created T541: "Object is unknown on server... re-requesting".